In Part Two of our year-long series chronicling the challenges and triumphs of two early career educators, we visit Brittney Norman and Zack Griffin during the time of year when the honeymoon has worn off, difficult student behaviors crop up, grades and evaluations become a factor, and exhaustion sets in. Both Norman and Griffin are part of an MEA-NEA pilot program, MiNewEd, designed to assist newer educators with connections and support through their early years in the profession. If you haven’t already, start at the beginning and read Part One of the series. Third-year teacher Brittney Norman believes caring relationships are the key to success. A little more than midway through the relentless stretch of school year between Labor Day and the holidays, third-year teacher Brittney Norman took off one of her two personal days to counter a feeling of burnout. She spent the quiet hours at home preparing lessons for the fifth graders she teaches at a school in Pine River, a sprawling rural region south of Cadillac. She knows she shouldn’t use her precious few discretionary days off to catch up on grading and planning. But she had been cutting into sleep and laboring on weekends, missing time with her 7-year-old daughter to attack the bottomless black crate of work she lugged home each day. Especially frustrating is that the same folks shaping education policy and perceptions—politicians, the media, critics in the public sphere—don’t understand the demands of teaching and don’t care to listen to educators trying to explain it. “I’m not complaining about my job; I’m telling you I care so much about my kids, their performance is affecting me personally,” she said. Near the end of the first marking period in November, the 29-year-old ended “lots of days” in tears, venting emotion that built up over the difference between the perfect classroom she envisioned in her mind and the struggles she was experiencing day-to-day. Norman admits her “over-achiever” personality causes her to focus more on what needs to improve than all the ways she’s doing well. For ideas and support, she relies on equally committed “teacher BFFs” willing to talk over new approaches or the latest issues. One such Best Friend Forever is Emily Adema, a special education teacher who assists in her classroom for part of the day. Adema shares teaching strategies and points out Norman’s strengths and successes when she’s too overtaxed or tired to see it for herself. Norman also is part of an MEA pilot program supporting newer educators in partnership with NEA. 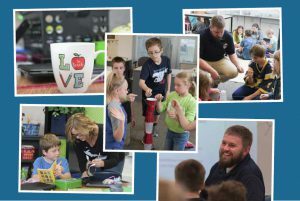 She and others involved in MiNewEd from Cadillac, Alpena, and Petoskey choose an annual goal or focus and receive guidance from a virtual mentor who is a master teacher. Norman changed school districts this year after spending two years at Cadillac Area Public Schools to be closer to home, where her daughter attends second grade, which means in effect she’s navigating the difficulties of a “first year” all over again. In addition to coaching middle school volleyball, she’s teaching a different population of students, learning a new reading program, and handling a larger number of kids—84 in total—since her new school rotates fifth graders between a team of teachers for different subjects. All of the teachers cover the reading curriculum with their “home” group, and Norman teaches math to all of the rotations. She’s excited about the reading curriculum, which challenges students to find themes, make inferences, and compare and contrast ideas across texts. However, she finds it difficult to reconcile the reading program’s structure, based on mastery of standards, with the pressure to fill the online gradebook with lots of grades—which parents can view through a Parent Portal. Norman doesn’t want to grade students on newly introduced concepts, particularly when the new ideas and skills are much harder than what the kids have seen before. She worries the grades will become labels and set up some children for failure before they’ve had time to figure things out. Additionally, when she does enter grades, she faces the struggle of students asking about assignments they didn’t turn in or pushing her to immediately score late work to change the “Incomplete” grade in the book. Another challenge of not teaching all subjects to the same group of fifth graders all day—as she did in Cadillac—has been finding time to get to know students on a personal level. She uses a “clip-up, clip-down” method of classroom management in keeping with other teachers at her school. Students move a clothespin along a behavioral chart on the wall to earn rewards, but Norman tends to focus on the positive instead of the negative. In class recently, one squirming boy was distracting others during a read-aloud about women’s suffrage. Norman called out the girl sitting next to him, telling her: “Go clip up. I like your active listening right now, sitting criss-cross and eyes on the speaker.” The boy turned and straightened. She also posted a magnetic chart explaining red, yellow, and green zones of behavior regulation—from her special education teacher friend—which outlines examples for students to recognize if they’re in an optimal learning zone and strategies they can use to redirect their actions. And she points to a bigger, longer term success she’s experienced with a boy whose difficult behavior many teachers warned her about. This student spoke disrespectfully to her and occasionally walked out of class without asking. He didn’t have many friends. Norman gave him a job in the morning which allowed him to come into the classroom when other students were outside. The move made him feel needed and gave Norman time to talk with him informally one-on-one—and his attitude and work ethic changed. First-year teacher Zack Griffin continues to look for ways to get every student engaged. He laughed, but the story was no joke. This 24-year-old is tired. He’s discovered a new appreciation for the sound of silence during his car ride home. And his gratitude has deepened for the empathetic listening and advice he gets from his parents who are educators. Griffin’s other solution for stress, fatigue, and frustration goes back to skills and habits he started learning as a toddler. He escapes Up North to hunt and fish. He unplugs from his everyday world and attunes to something bigger—quiet, stillness, birds calling, a breeze blowing the leaves. As Griffin winds through his first year as a sixth-grade science teacher at Mackinaw Trail Middle School in Cadillac, he wishes he had a cloak of invisibility like Harry Potter. It might help him understand the unpredictably moody, impulsive, sometimes disrespectful behavior he witnesses among his 125 students. Near the end of the first quarter, Griffin wrote up his first discipline report on a student who was bullying another child. Less clear cut is how to deal with unmotivated students who don’t want to participate in groups or work on assignments. Griffin offers students a clean slate every day. He talks constantly in terms of ARE (Attitude, Respect, Effort) to ask if they are giving their best. His experience as a varsity football coach at the high school—he’s offensive line coach—informs his teaching and his outlook. The leap from student teacher to full-time faculty member means not only more students to learn about, but more of everything: more faculty meetings, more absent students to catch up to speed, more interruptions to lessons, more IEP meetings, more paperwork and data collection. The average person doesn’t understand the volume of information coming at a teacher throughout the day, or the number of tasks that educators juggle while making decisions about how to respond or adjust to individuals and circumstances, Griffin said. “I used to think during my student teaching that this was just straight like an arrow. No problem, I’ve got my lesson; I’ve got all my objectives; I’ve got my assessment. All the kids are here. I’ve got all my groups figured out. He has felt supported, even during his first formal observation. The district uses the Marzano evaluation tool, which took a long time to fill out before his pre-observation conference. The tool covers 41 elements of teaching, though the district is focused most intently on five of those. His principal reassured him the evaluation is meant to help—not judge, Griffin says, so he wasn’t too nervous except while fighting indecision about what to do in his lesson that day. The observation went well, and he appreciated getting useful feedback afterward, he said. Griffin tries to make learning relevant and ask students to apply what they know in assessments tied to real life. It can be a struggle—as when he challenged students to survive on a deserted island with no drinking water supply during a unit on evaporation and condensation. Some students asked about the island—if it had coconut trees or other ready sources of liquid—instead of turning to their knowledge from class. Finally other kids asked, “What if we used science?” And Griffin watched as they devised plans to trap evaporating water as condensation. “I was really excited about that,” he said. His goal is to continue figuring out how to meet kids at their level and teach them something new—how to reach the quiet ones and the talkers, the advanced kids and the hiders, the students driven by grades and those few who don’t seem to care about school. As part of his involvement in an MEA pilot program targeting new educators for additional support, Griffin will work with a virtual mentor on his chosen goal for the year: differentiating his teaching. He will try new strategies and reflect on results with the help of a master teacher. Recently he tried out a team-building activity during class after noticing his groups devolving into disagreements and dictatorships, he said. 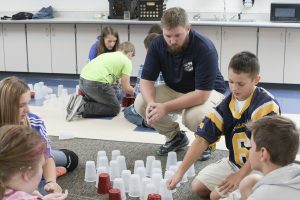 The students were asked to work together to build plastic cups into a tower using only strings to move them—no hands or other devices. The results were an eye-opener. One boy who normally is disengaged and off-task led his group. And the class filled with higher-achieving students struggled with the challenge more than another class of kids with lower grades and more learning difficulties.